British Columbia B.C. pipeline blast disrupts service to customers across province and into U.S.
B.C. pipeline blast disrupts service to customers across province and into U.S.
A pipeline ruptured and sparked a massive fire north of Prince George, B.C. Natural gas customers in B.C. and Washington State are being asked to curtail their energy demand after an explosion of a natural gas pipeline in central British Columbia that could disrupt supply. A section of the pipeline owned by Texas-based Enbridge Inc. ruptured on Tuesday evening in the Lheidli T’enneh Nation community near Prince George, sending up massive flames that forced the evacuation of about 100 people and led to the shutdown of both oil and gas supply lines in the region. Joshua Seymour lives roughly two kilometres from where the line ruptured. After a loud explosion, he looked outside and saw a fireball, and then watched in horror as the fire spread along the pipeline route. He grabbed his eight-year-old son and called his mother, who lives even closer to the blast site. “I could feel the heat through the windows,” he said. The community doesn’t have a formal evacuation plan, but members agreed they needed to get out. They went door-to-door to ensure no one was left behind. Then, with shards raining down on them, they fled. The Transportation Safety Board (TSB) is investigating the cause of the blast and it is unclear how long it will be before the system is restored. B.C. Premier John Horgan said he was deeply concerned by the pipeline rupture and appealed to the public to restrict gas usage until further notice from gas company FortisBC. British Columbia has been at the centre of a national debate about new energy pipelines, and the incident will raise questions about pipeline safety. Across the country, the TSB has investigated six pipeline incidents in the past six years. The rupture occurred on a 36-inch transmission pipeline carrying sweet natural gas that ignited. There were no reports of injuries as a result of the incident. Tuesday’s explosion affected the two main Enbridge lines used to move gas into FortisBC’s gas system to serve customers in the Lower Mainland and on Vancouver Island. In addition, the Pembina crude oil pipeline that also runs through the First Nation’s reserve remains shut down. At the time of the incident, the line was not flowing, having just completed a delivery to the Husky Oil refinery in Prince George. The Pembina line was shut down at points on both sides of the incident, and the company is draining down the line. 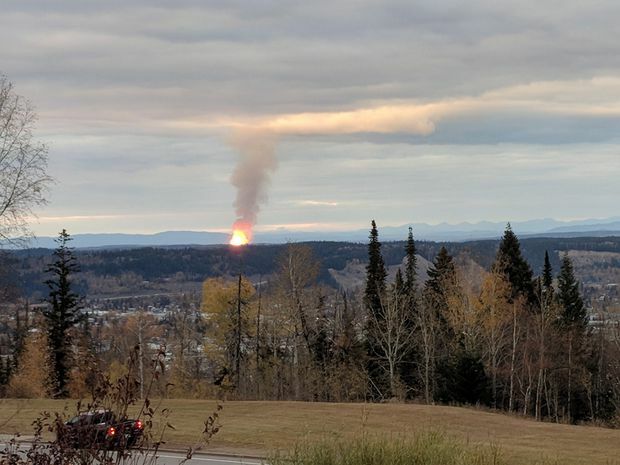 FortisBC said it shut off about 128 customers in Salmon Valley, just north of Lheidli T’enneh Nation, because gas flow was disrupted, and estimated that about 700,000 customers – 70 per cent of its one million gas customers – could temporarily lose gas supply due to the incident. Canfor closed two pulp mills in Prince George in response to those concerns. FortisBC requested customers across B.C. turn off their thermostats and limit use of all other natural gas appliances – an alert echoed by Puget Sound Energy, which serves 10 counties in western Washington, and Cascade Natural Gas, which serves dozens of communities in Washington and Oregon. Mr. Seymour, who spent Tuesday night in a Prince George hotel with his family, said he has been told it is safe for him to return home, but he was unsure after a community meeting with Enbridge about what to do.